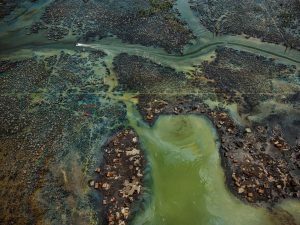 The genesis of the project was a question posed by Baichwal to Burtynsky: “What if we could make ‘anthropocene’ a household word?” Yet the term itself is a fraught one. There is still no agreement in the scientific community about what we might call the Age of the Human, or even when it began. Two scientists from the Anthropocene Working Group contribute an essay outlining the evidence for their claim that we are now in a new geological epoch—evidence that forms the framework of The Anthropocene Project. But as art historian Karla McManus points out in her contribution, the term has cultural and social connotations beyond those of the hard sciences. Some commentators have pointed out the hubris of naming an epoch after ourselves; others have noted that the term emphasizes the human—anthropo—above all else on the planet, which is exactly why we find ourselves in our human-altered epoch in the first place. Cultural theorists like Donna Haraway have argued for the use of the term Capitalocene, meant to acknowledge how nature has been commodified by capitalism’s powerful economic forces. 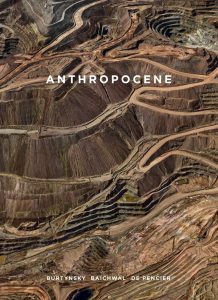 With its striking cover photo of the vast workings of a silver mine in New Mexico—a photo that appears almost three-dimensional—Anthropocene (the book) is emblematic of the contradictions embedded in this project. For a start, how do we read the photo? As a purely aesthetic experience, given its sinuous lines and coppery tones? As a testament to human ingenuity? Or as one example of the destruction we have wrought? Like many of the photographs reproduced in the book, the aerial perspective enacts distance, aloofness, cerebrality—key characteristics of the very hubris that The Anthropocene Project is presumably critiquing. This reading is reinforced by a comment from Nick de Pencier about the collaborators’ choice of lens-based media. “[They are] the most technological, most anthropogenic, of the art forms, and that is why we feel confident deploying them for this project.” Were the project’s creators aware of the profound irony of distancing viewers even further from the world around them by creating such simulacra of it? This enchantment with technology is immediately evident in the four-page photo spread that opens the book, showing a camera fastened to the front of a train in order to capture the Gotthard Base Tunnel in Switzerland—the experience of machines rather than humans, in other words. This numbing was my own response to the book, though I was moved by several photographs taken at ground level: a sequence recording a massive pile of elephant tusks being burned in Kenya, for example. But much of the time I wanted to throw the book across the room. In a month when the Intergovernmental Panel on Climate Change—notorious for its overly conservative estimates—tells us that we have twelve years to avert ecological catastrophe, it feels frankly preposterous, not to mention criminally self-indulgent, that we are still observing, documenting, recording—still bearing witness, though what we are mostly bearing witness to is our own profound denial. Is another artistic project, no matter how spectacular, really what we need at this stage? Not to mention the paradox of the project’s own contribution to carbon emissions and excessive resource use (all those long-distance flights, all that technological equipment). Events, however, are overtaking The Anthropocene Project. In September, fifteen-year-old Greta Thunberg went on “climate strike” at her Stockholm high school, a decision that has inspired students across Australia and elsewhere to do the same. In October, a new UK-based movement, Extinction Rebellion, issued a Declaration of Rebellion to hundreds gathered in Parliament Square in London. Describing itself as “an international movement, using mass civil disobedience to pressure governments to enter WWII-level mobilisation mode in response to climate breakdown and ecological crisis,” it is organizing an ambitious series of strikes, gatherings, and other actions intended to cause major disruption across the UK. It has been endorsed by dozens of academics, scientists, and Green Party politicians, and is scaling up its nonviolent movement globally.